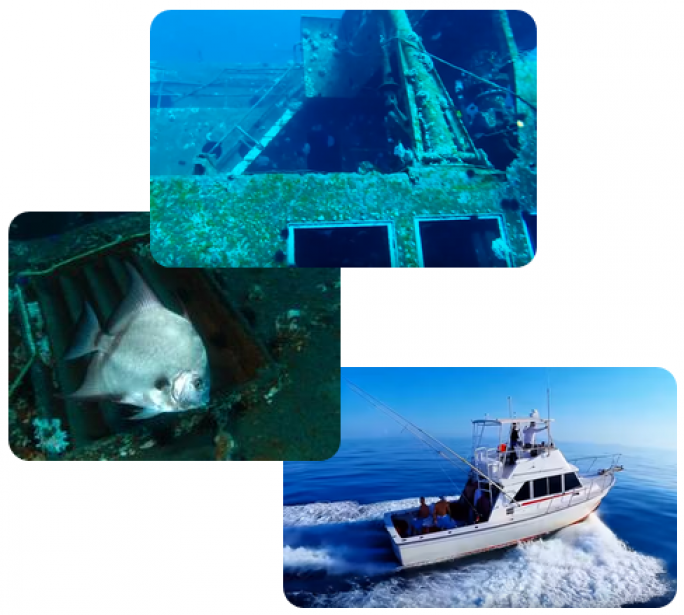 The Texas Clipper (sunk in 2007) is the country’s third-largest ship sunk as an artificial reef and the largest outside Florida. When she was sunk, instead of drifting straight down, the bad weather caused her to list and land on the side. Even lying on her side there is still plenty to see and explore. We will be getting in 3 dives while we are out. Built by Bethlehem Steel in 1944, she was first named the U.S.S. Queens and she sailed some 1.3 million miles, including to Japan in World War II, where she was the first attack troop transport ship in Iwo Jima. Four years later, she was rechristened the S.S. Excambion and ushered into the world of ocean liners. This ended in 1958, and the federal government reacquired her for its reserve fleet. Seven years later she was loaned to the Texas Maritime Academy, in Galveston, Texas, a precursor of Texas A&M University. For the next 30 years of her active life, as the U.S.T.S. Texas Clipper, she was a merchant marine training vessel for Texas A&M students, who once again sailed her around the globe. Some of the underwater life that can be expected are: snapper, trigger fish, damsels, amber jack, angelfish, blennies, octopus and many more. Most of the entire vessel is encrusted with barnacles, corals and other life. We meet at Sea Ranch Marina between 6:30 and 6:45 in the morning. Find the boat "La Sancha." With luck we are on our way out by first light. No gear is included with the cost of the trip. Cylinders and dive gear must be rented separately unless you already own your own. If you do not have something, check out our Rental Page. $230 per person for Scuba Divers for a 3 tank dive. If we cancel the trip due to weather or lack of people, the trip can be rolled to another date, credited to your account or refunded. If for any reason you need to cancel, you have up untill 1 week before the trip. Any closer and your money will not be refunded unless the trip runs full and we can sell your seat.